George Ernest Willers was born in Harston on 18 Dec 1890, the son of Thomas and Harriet. He lived in Button End with his parents, one brother and four sisters until 1920s when he married and moved to Cambridge. He died on 20 June 1974. George Ernest Willers (compositor) enlisted May 1915 in the Cambs Battalion of the Suffolk Regt. Promoted LCpl in October 1915, Cpl in January 1916 & Sgt in the following March. On leaving the Suffolk Regt he was attached to the Kings Royal Rifle Corps before being transferred to the Rifle Brigade. He was wounded in May 1918 and demobbed in February 1919. The staff of the Printing House worked a 54 hour week. During this, a journeyman compositor might expect to earn 36s at a time when the schoolmaster in the nearby village of Harston was paid 33s and a farm labourer was paid 11s. In 1912, G E Willers, a compositor, was the highest paid working man in the village. Most villages in this area depended on agriculture for a living. Many of the men worked on the same farm from school days until they were too old to continue. There was a system of Parish relief, which as far as I can recall, consisted of loaves of bread being granted to those who were in extreme poverty. Around 1900 the wage of an agricultural labourer was 11 shillings per week. For the man who looked after the horses an extra 2 shillings per week was granted as he had to attend to the horses during the weekend.The man who fed and milked the cows was treated in the same way. There was little or nothing in the way of unions and men relied on their employers for an extra shilling or two when any special work was needed. During harvest men worked until it was dark and it was the custom to pay men at the rate of £2 a week or in some cases a bargain was arranged for men to take on for the duration of the harvest in which case they could be fortunate in having fine weather or unlucky if the weather was bad. A certain amount of piece work was sometimes fixed and agreed with an employer. Some married women undertook charring for folks who could afford to pay and often there were perks to be had in the shape of food or of clothes which had become too small for the better-off families. After harvest stacks of corn, also of hay, had to be thatched in order to keep out the rain. This was a job which needed to be done quickly and men doing this work kept going as long as they could see. Thatching stacks was not the skilled work that was required for houses but at the same time it required a certain amount of skill or rain would drive in and spoil much of the corn. Thatching was of course only needed around harvest time and men had to find other work to do and making hurdles for folding sheep was often a task that fitted in between thatching. Hurdles were made from boughs cut from willow trees as they were plentiful and very easy to split and join up. Usually this work was done on piece-work at a certain price per dozen but I have no idea as to the price charged. Shepherds were always regarded as being a bit superior to labourers and were better off financially as they were compensated for the long hours they worked by being given an amount for the number of lambs that were reared. Often during bad weather the shepherd remained with his flock snatching what sleep he could in a hut provided by his employer. The hut had a small stove in it and often a sickly lamb was brought in by the fire and kept alive in this way. Thrashing corn with large traction engines with drums and elevators took place sometime in the autumn but if a farmer could afford to hold his corn and wait for a rise in price it could mean a bigger profit but again he had to run the risk of a slump and also the risk of rats ruining much of the stacked corn. Traction engines were used for ploughing in the larger fields. Two engines were used taking up their position at opposite ends of the field. A plough was drawn by means of a cable moving backwards and forwards until the whole field was ploughed. The land where the engines moved called the headlands was usually finished off by ploughing with a horse plough. Combine harvesters now cut and thrash the corn in one operation and a large amount of straw is fired. Shearing sheep was carried out with clippers and needed skill to avoid spoiling the fleece and also to avoid nicking the flesh. Dipping sheep was necessary to get rid of dirt as sheep were mainly folded in the open fields but straw bales were placed round the fold at lambing time giving some protection to the young lambs. Carriers came into Cambridge two or three times each week and they usually undertook to do a certain amount of shopping making a charge of a few pence. At the end of harvest with the extra money earned it was usual for families to go into Cambridge to buy clothes and shoes etc. Village shops supplied a fair amount of goods but of necessity were more costly than prices in the town. Often the village shop was also the Bakery and all bread was then baked in an oven heated by burning wood which was cleared out when the correct heat was obtained. The dough having been punched and allowed to rise was then moulded and shaped to the correct size and placed in the oven until baked. A long handled shovel, called a peel, was used for moving the loaves into and out of the oven. It was a fairly common custom for the baker to undertake baking pies for his customers while the oven was still hot, and for this service the charge was usually a penny. The shoemaker was of considerable importance in a village and was always busy. Some were craftsmen while others were regarded as “Snobs” being able to sole and heel shoes but not able to make them. There was always the smell of leather and of wax which was used for shoes that needed stitching. The building trade largely consisted of family concerns doing repair work with an occasional house being built. Many houses were built of claybats which stood for a good many years but which.were very damp as they had no damp course. These small builders were all-round men capable of doing all the work themselves but of course they were free from Town and Country Planning restrictions. Carpentering and wheelwrights have been dealt with in great detail by Sturt and Rose and there is little that can be added. 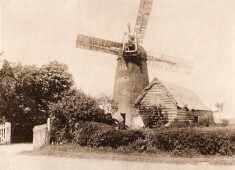 In my very early days a windmill was working between Harston and Newton, the lower part of the mill still remains. I think it was only grinding corn for cattle as it was not economical and the more modern mill by the river was naturally taking away local trade. This mill in its turn has become obsolete. Mole catching was considered a job which certain men were especially accomplished at as knowing the habits of these little creatures. Mole skins were cured and made into coats, etc, for ladies. Previous to this mole catchers often made the skins into waistcoats. Game keepers were not much in evidence in the south of Cambridgeshire as there were few large estates. Wells were bored for providing water both for domestic purposes and for supplying cattle etc. When the well had been made and sufficient water obtained it was usual to fit a pump to draw up the water to bring it to the surface. Nut-butts were used for draining – branches of hazel trees etc. laid in trenches, because they lasted well and did not rot. This page was added on 01/02/2019.